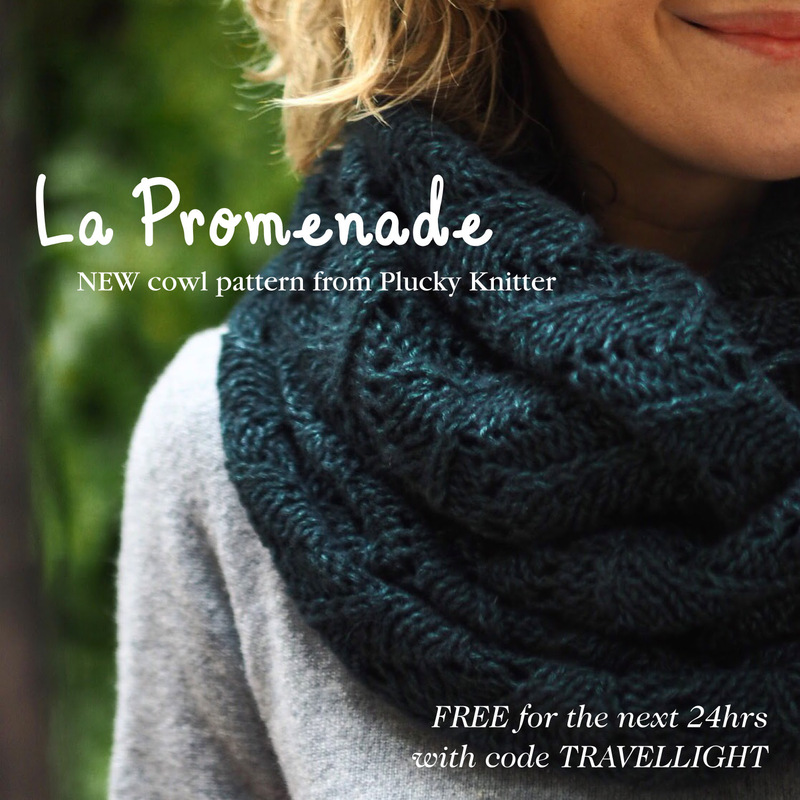 La Promenade – A New Cowl! Talk about a quick trip. I was skeptical of all I had on my plate for these six days (four days if you count the two days for travel), but I did it and boy, does it feel good to be home with my guy, my pups, and the crew! The meet-and-greets, sight-seeing, and shopping were all fantastic, but for me, there’s truly no place like home. Being that I was determined to pack light and travel with only my carry-on for this short trip, I had to be strategic in my outfit and knitting plans. Because I love (need!) having a cowl or shawl around my neck at all times (really, I do! 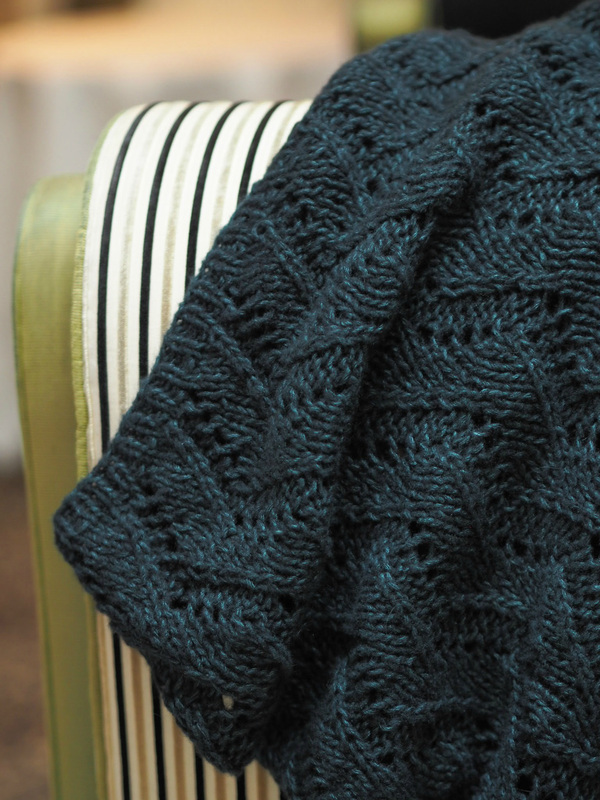 ), and had limited space to pack my favorites, I opted for my new La Promenade Cowl. Let me tell you, it was the perfect travel companion. Feather light, lofty and airy, I wore it nearly everywhere. Walking here, there and everywhere – La Promenade was my constant companion through it all and, of course, accompanied me while scouring the flea market, visiting Lil’ Weasel and site seeing in Paris. La Promenade is written for our Spiffy sport weight yarn, and showcases it’s unique structure and loftiness. Between the pattern dimensions, stitch pattern and the unique qualities of Spiffy, it creates a cowl that is light as air yet substantial enough to provide the cover and structure I adore in my heavier favorites! 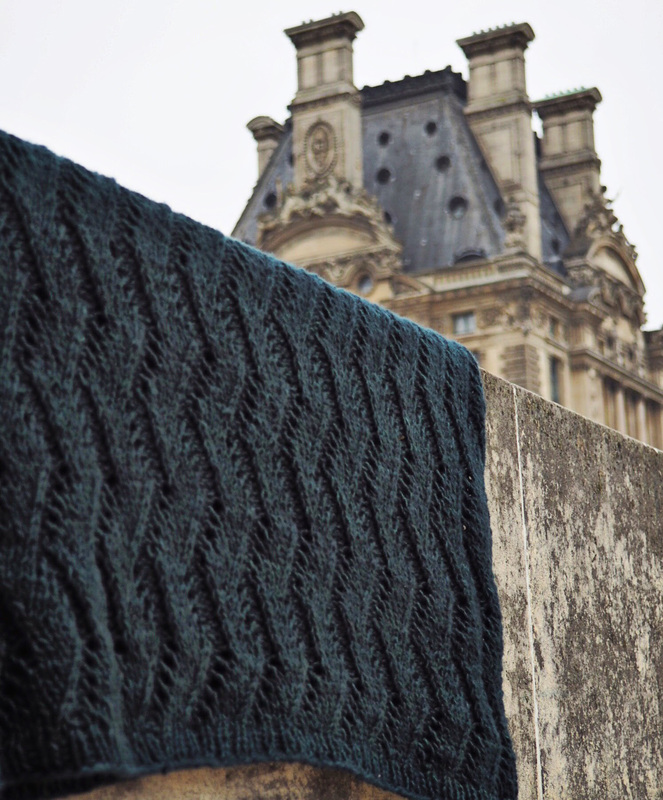 La Promenade may certainly be knit in (and be just as lovely!) Cashmere, Traveler, or Primo Sport for a cowl with a little bit more “umph”. 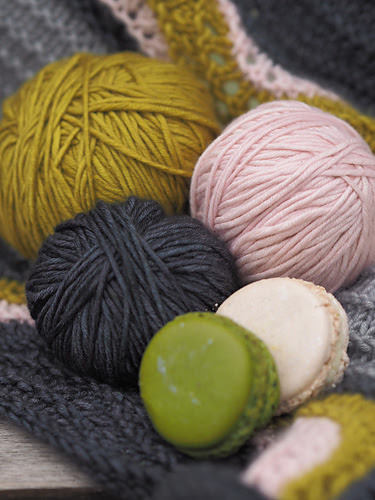 As with any yarn substitution, just be mindful that the fiber content of the yarn you choose will alter the final drape and structure of your finished knit. We hope you take La Promenade on your next adventure! So much so, we’re going to make sure you have the opportunity to grab your pattern and cast-on right away! Until Midnight of Thursday, March 24, 2016, EDT, you may download La Promenade absolutely free with the code TRAVELLIGHT. You may find the pattern in ourRavelry store or via our website. Simply add it to your shopping basket, apply the coupon code above, and continue to checkout to receive your free pattern. We hope you enjoy this great, simple yet effective pattern as much as I do! 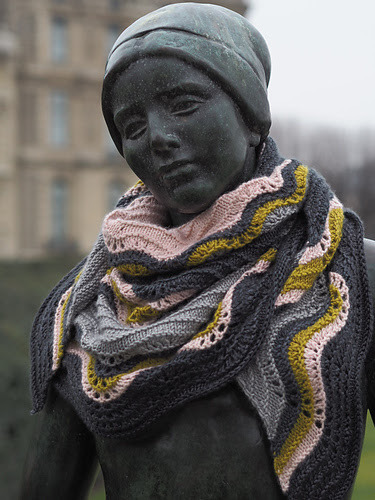 Be sure to show us on Instagram or in Ravelry how you wear and use your La Promenade with #dailyplucky on IG or tag your project in Ravelry with “dailyplucky“. I can’t wait to see what adventures you’re up to! 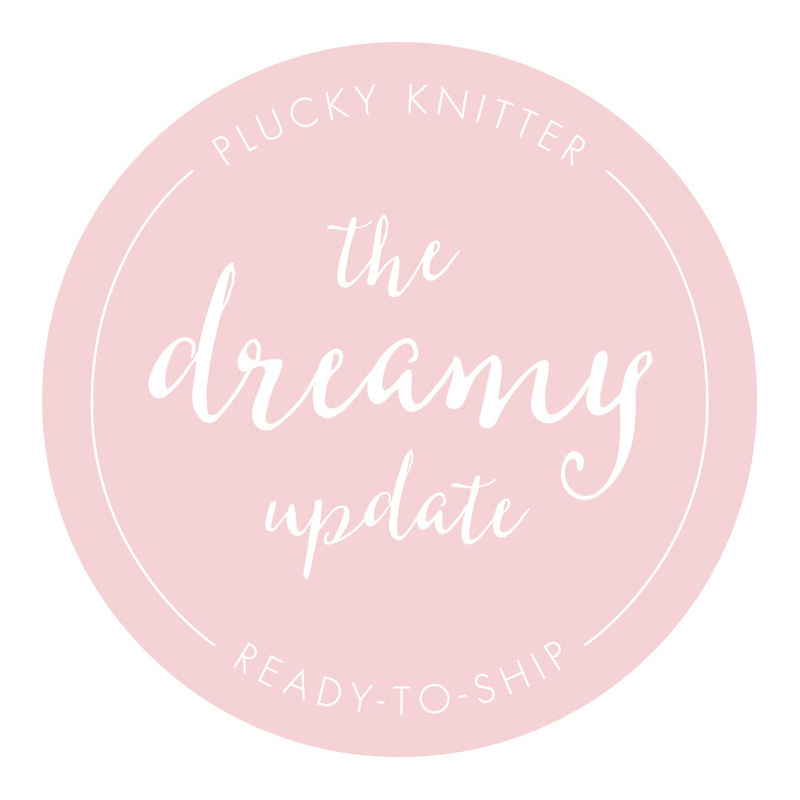 https://www.thepluckyknitter.com/wp-content/uploads/2017/05/new_small_logo@2x.png 0 0 Sarah https://www.thepluckyknitter.com/wp-content/uploads/2017/05/new_small_logo@2x.png Sarah2016-03-23 13:31:022016-03-23 13:35:58La Promenade - A New Cowl! Let’s bring back those oldies, because they sure were goodies! Just like your favorite songs of yesterday, let’s reminisce about Plucky colors that we haven’t seen in a while. As our Plucky group has grown, and time has marched on, there are so many great colors that have been waiting to reintroduce themselves or (sob!) to take a final bow. If you’re new to Plucky, you may never have seen Nova, Faded Ink, Gimlet Haze or Oh Deere in the wild. Do you remember Bubble Gum Flower or Classic Rock? Now is the time to become acquainted with these old classics! I know Hayley and I are super excited about their return – I’m already adding some to my personal stash – what’s old is new again! The colorways and bases (so far!) are shown below and a full list can be found here! This update is a special one, as some of these colors have been gone for ages and will go back to the vault after this update. Therefore, this update will be held as a two part update so as to accommodate as many schedules as possible. Please join us on Friday, March 11th at Noon EST and Sunday, March 13th at 8:00 P.M. EST on the Plucky Blog, as we unlock the Golden Oldies vault. Please note that this is a pre-order update and will be held on the Plucky Blog at the dates and times listed above. If you are new to Plucky we invite you to read all about our Blog Updates in the FAQs found HERE. Also, be sure to sign up for our eNewsletter and download our Plucky Knitter app (links below) so you are always up-to-date on events and news.